As some of you probably noticed, I haven't been around much lately. As busy as I was this summer with work, I really tried to get out as much as I could with my wife and kids. It didn't always work out and we definitely had to miss out on a few things due to my schedule, but we tried to make the best of it. I figure I'll spend the next few posts showing you all some of the fun things we did get to do. Perhaps they will provide a bit of inspiration for one of your stories or poems, or perhaps you might find an interest in a new hobby or activity. Who knows. Today I would like to tell you about the "You-Pick-It" farm. This was definitely an extraordinary excursion. It took us about fifteen minutes or so to drive to the farm where all produce was purchased by box increments. The boxes were like orange boxes I always see at the store around the holidays. 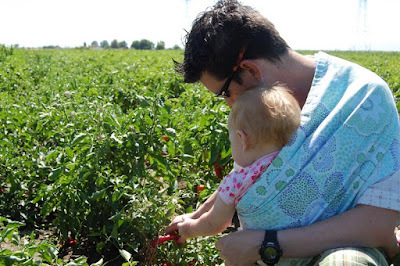 We discovered that buying tomatoes this way was incredibly cheaper than buying from the store. Another good thing about it was that we could pick our tomatoes right off the vine, and there were acres of tomato plants to choose from. On the same note, we did end up going a bit later in the season than was optimal. There were a lot of good tomatoes, but a lot more that were stepped on and some that were rotting. I reread that and the first thing that comes to mind is how it must have smelled, so let me ease your troubled mind by saying that even though some were rotting, it did not smell like a compost bin. You did, however, have to carefully examine a tomato before just automatically reaching your hand out to grab it. A few thumbs into the squishy, decaying flesh of rotten reds will teach you that lesson with a quickness. Another thing they had at the farm was peppers. Lots and lots of peppers. We picked ancho, chayanne, and jalapeno peppers. The Bells were a bit past due, unfortunately. All in all, we had a lot of fun and filled up our food stores with an abundance of summer flavor. We also learned a lot about what worked and what didn't work in our own garden. For one, I planted way too many cucumbers! The kids do enjoy the pickles their mom made for them though, and all the cucumbers we didn't use went into the compost. Hi Brady, found you on a link to a link to a link...This farm sounds like fun! Hope you enjoy your produce for many months to come :-) without getting too tired of it. I've been writing mostly short stories this year, but work has been rough and I haven't written as much as I would have liked. Now that all the crazy hours are over with I find myself traveling more for business than before. Mostly though, I'm just always feeling tired. It seems like my body needs to finally catch up. Thanks for stopping by! I hope to have another post up this weekend. I've got some other fun activities to write about! That was a "fun" experience. We had our own backyard garden before and it was good to watch the plants grow and then pick the fruit of your labor eventually. I have also read in another blog about a :pick up farm" just like this one and they had so much fun too. welcome back and all the best. I've always found farm fresh food so much better than store stuff. I did that sort of thing many years ago with the kids. Not done it just lately but recall the taste so well.